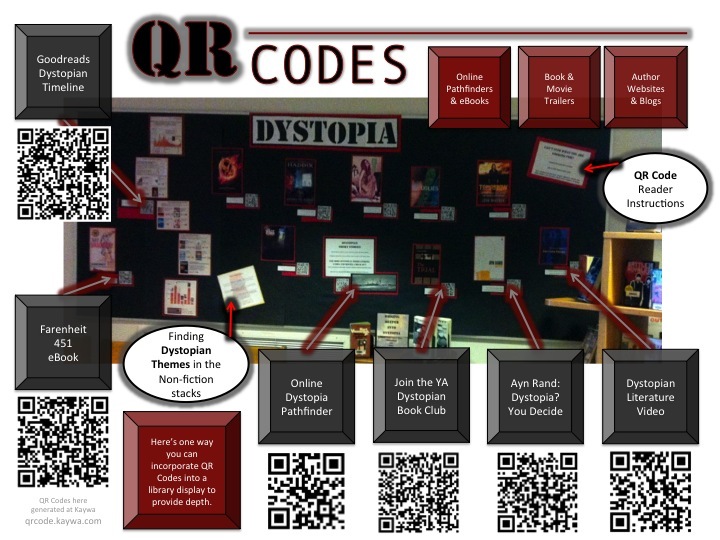 The Vagabond’s Dystopian display featured QR Code links to multi-media information, resource guides, videos, an eBook, opinion pieces, genre information, and opportunities to participate in online discussion about YA Dystopian Literature and Non-fiction. Every QR Code featured in the display is accompanied by the URL so that students without QR Readers can find all this awesome information, too. QR Codes often get a bad rap, and often for good reason. When I first encountered QR Codes, I downloaded a QR Code Reader app with some excitement and began to scan. I was immediately, and then repeatedly, underwhelmed. It seemed every QR Code I scanned led me to an online page with the exact information I was looking at in person. Potentially useful if you are standing in line and want to save information for later. But, kind of silly and redundant. And, boring. I gave QR Codes another try during my summer gateway course for Library School. My poster session group, and many others, used QR Codes to provide online handouts, resource guides, and further information about our topics. Attendees who were interested could access and bookmark our resources quickly and easily for later reading and viewing. The potential for these little black and white boxes was clear, but I just wasn’t finding evidence of great QR Code uses outside of Library School. Until I went to Denny’s. This Vagabond Librarian and her Vagabond Boy were punchy with exhaustion after a day of flight delays. We were both thrilled to see that our hotel was next to a Denny’s, where we could have some late-night comfort food before heading to bed. While we were waiting for our breakfast-for-dinner, we scanned The Hobbit QR Codes on the menu. Something very cool happened. We watched a movie trailer. We watched behind-the-scenes video clips. We read about the making of the movie. We talked about the first time I read The Hobbit and loved it and the first time he read The Hobbit and was disappointed there weren’t more battle scenes. We accessed content that went well beyond what we could see on the menu, and even better than that–we were entertained! Start with materials to which you know your students have access. In this case, I started by looking in the library catalog to find titles and series to feature that I knew students could find at this library. I also checked to make sure the sites were accessible on the school network. Let students know “where they will go” when they scan the QR Code. I included a brief description of the linked material next to each QR Code on this display. Link to material that is relevant and interesting to students. Get to know what students are reading, what they like about it, and what some of their interests are. Hint: if you find it boring, they probably will too. Link to material in a variety of media that allows students to investigate the topics further. This display includes links to trailers, author videos, and a genre overview video. Including links to music that features dystopian themes would be wonderful, too. Link to material that allows students to engage with others to express their own ideas and post their reflections about what they’ve discovered and read. I linked here to author blogs, as well as book review blogs and an online dystopian book club students can join. Provide a back-up method for accessing information. I did this by providing a URL to accompany each QR Code. Given more time, I would also feature each of these links on a web page accessible through the library website. Imagine the power of these kinds of exhibits if Google Glass takes off?!? I am totally in love with both your display and the fact that you included QR codes in your display! I think you made it creative and eye catching to the point that students are going to be entertained with your display just like how you and your boy were entertained with the QR codes at Denny’s!! Please update on how the students react to the display! I’m really interested in what kind of feedback you receive!! Thanks, Emerald! I can already tell you how they liked it–I actually did this display last spring. I got great feedback about the display in general and good feedback about the QR Codes, but I was glad that I included the URLs beside the QR Codes because a number of students did not have mobile devices that could read the QR Code. (I think that will become less of an issue as smart phones and tablets are around longer and as schools develop improved BYOD policies). I was surprised that the link the students liked the most was the eBook link to Farenheit 451, which the 10th graders were reading at the time in English. They also really liked the “Dystopia Pathfinder,” and the author sites that led them to find more books like the ones they already liked. Many of them weren’t aware of what QR Codes were for when I put up the display, and at first I had to drag them over to the board and show them how to use it. I’m fairly sure that initially they tried it out to humor me, but I think/hope they found real value in accessing the information there. Wondering what standards the use of QR Codes in the classroom supports? AASL Standard 3: Share knowledge and participate ethically and productively as members of our democratic society. Indicator 3.1.4 Use technology and other information tools to organize and display knowledge understanding in ways that other can view, use, and access. Students could engage in a research project to answer a question and could publish their findings in a print format that included text, images, and QR links to further resources and enrichment information about the topic. Or, even better, QR Code links to student-created media that offers further exploration of the topic. 6-8.W.6 Use technology, including the Internet, to produce and publish writing and present the relationships between information and ideas clearly and efficiently. 6-8.W.7 Conduct short research projects to answer a questions (including a self-generated question), drawing on several sources and generating additional related, focused questions that allow for multiple avenues of exploration. Thanks for a thoughtful and inspiring post. So glad to read the story of The Vagabond Librarian and her Vagabond Boy stumbling across the real potential of QR codes at Denny’s that night. It was the start of a new relationship with QR codes. Your top takeaways are great. Thank you! It certainly was a turning point in understanding the value of a QR Code. My son describes the ones that link to great information as “portals”–as in, “do you think this portal leads anywhere cool, or is it a dead end.” It’s nice that more and more often the “portals” lead somewhere cool!